This soup is spiced up with ginger root and many other herbs and spices including cinnamon. Both ginger and cinnamon are known to help prevent memory loss as you age. In a dutch oven or large pot, heat the walnut oil. Add the shallots, onion and ginger. Cook until tender. Carefully add the chicken broth and cider. Cook and stir over medium heat until thickened and bubbly. Stir in the pumpkin, maple syrup, bay leaves, dried thyme, cinnamon, pepper, and cloves. Bring to a boil and then reduce heat. Simmer for about 20 minutes. Remove from heat and discard bay leaves. Pour mixture into a blender and blend until a smooth consistency is reached. 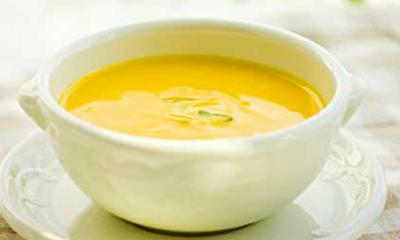 Pour pureed soup back into the pot and stir in the Greek yogurt and vanilla until it is thoroughly combined. Serve with a dollop of Greek yogurt and fresh thyme on top if desired.